Looking for the best for your horse? 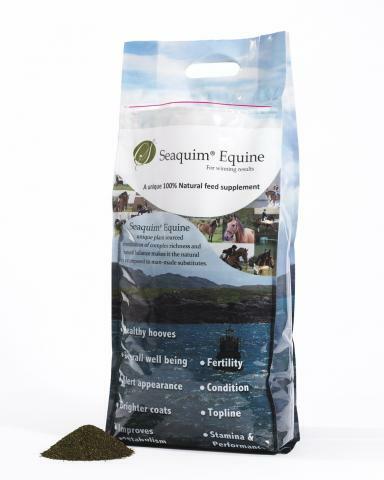 Seaquim Equine is a totally natural multi-mineral supplement, containing a wide range of naturally balanced chelated minerals, trace elements, amino acids and vitamins. Seaquim Equine is derived from an easily digested minerally rich plant and can be fed safely to horses of all ages. Hooves are critical to horse’s performance as the old adage says, no foot, no horse and sequim equine is particularly beneficial for troublesome feet, with remarkable results being seen after using it. Owners often report that farriers comment favourably on how their horse’s hooves have improved after feeding seaquim equine. Seaquim Equine effectiveness is not derived from any one single component but more from complex mix of inherently balanced constituent parts in easily digestible vegetable form. The dust free nature of seaquim equine is much preferred by horses and their handlers alike. Seaquim is available in both 5kg and 10kg bags. For more information please do not hesitate to contact us.